Polarized light was a very useful and interesting way to view objects through the microscope. The analyzer is screwed into the bottom of the draw tube (being placed above the objective) and the polarizer element is screwed under the stage in some fashion to an adapter, not now present. The first person generally known to have incorporated polarized light accessories to a microscope is Henry Fox Talbot around 1834. Calcite crystal prisms are used in the optics of these accessories to achieve the result and these still work well over 170 years later. 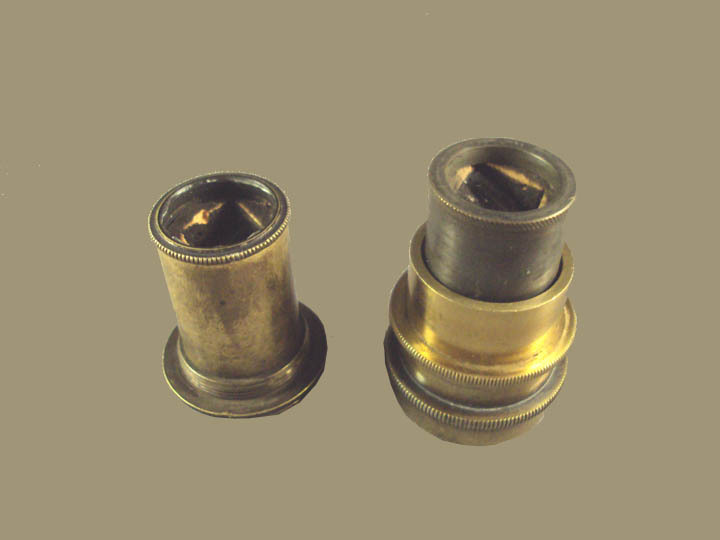 It is remarkable that only 6 years after talbots description this was a standard accessory on James Smith's Best microscope. Perhaps equally interesting, most illustrations of the accessories of James Smith's Best Microscope, even years later did not picture the analyzer or polarizer at all (for instance see Wythes frontispiece illustration from 1856, in the first picture in the main web page for this microscope illustrating Smith's Stand). Although the principals and uses of this technique are beyond the scope of this website, further information on the practical and theoretical aspects of this are readily available.